Microarray technology provides researchers in the life sciences with a revolutionary tool for measuring gene expression. However, this highly developed process involves multiple steps, from sample selection to data analysis, each susceptible to potentially costly errors. Without sound quality control, experimental microarrays may produce useless or, even worse, misleading results. 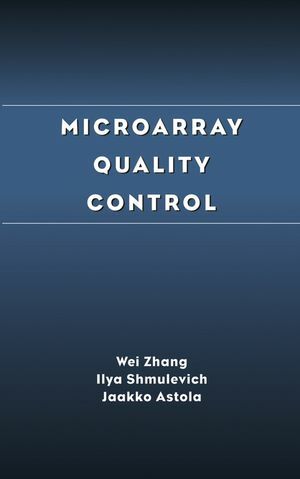 Written for the broad group of workers-biologists, mathematicians, statisticians, engineers, physicians, and computational scientists-involved in microarray studies, Microarray Quality Control features a straightforward style easily accessed by various disciplines. Useful checklists and tips help ensure the integrity of results, and each chapter contains a thorough review of pertinent literature. The only complete, systematic treatment of the topic available, Microarray Quality Control offers students and practitioners an invaluable resource for improving experimental quality and efficiency. Wei Zhang, Ph.D., received his Ph.D. degree from The University of Texas Graduate School of Biomedical Sciences. He joined the faculty of M. D. Anderson Cancer Center in 1994 where he is currently an Associate Professor and the Director of the Cancer Genomics Core Laboratory. Dr. Zhang’s research programs include cancer genomics and informatics, tumor suppressor genes, and signal transduction studies. Dr. Zhang has published over 100 peer-reviewed research papers, 14 book chapters and two books (Statistical and Computational Approaches to Genomcis, Genomic and Molecular Neuro-Oncology). Dr. Zhang is an Associate Editor for American Association of Cancer Research journal Clinical Cancer Research, and serves on editorial board of journals Cancer Biology and Therapy, Histology and Histopathology, International Journal of Oncology, BMC Genomics, Technology in Cancer Research and Treatment, and Molecular Cancer. Ilya Shmulevich, Ph.D., received his Ph.D. degree in Electrical and Computer Engineering from Purdue University, West Lafayette, Indiana in 1997. In 1997-1998, he was a postdoctoral researcher at the Nijmegen Institute for Cognition and Information at the University of Nijmegen and National Research Institute for Mathematics and Computer Science at the University of Amsterdam in The Netherlands, where he studied computational models of music perception and recognition. In 1998-2000, he worked as a senior researcher at the Tampere International Center for Signal Processing at the Signal Processing Laboratory in Tampere University of Technology, Tampere, Finland. Presently, he is an Assistant Professor at the Cancer Genomics Laboratory at The University of Texas M. D. Anderson Cancer Center in Houston, TX. He is an Associate Editor of Environmental Health Perspectives: Toxicogenomics. His research interests include computational genomics, nonlinear signal and image processing, computational learning theory, and music recognition and perception. Jaakko Astola, Ph.D., received his B.Sc., M.Sc. and Ph.D. degrees from Turku University, Finland. He has worked at Turku University, the Research Institute for Mathematical Sciences of Kyoto University, Kyoto, Japan, Lappeenranta University of Technology, Lappeenranta, Finland, and Eindhoven University of Technology, The Netherlands. From 1987 to 1992 he was Associate Professor in Applied Mathematics at Tampere University, Tampere, Finland. From 1993 he has been Professor of Signal Processing at Tampere University of Technology leading a group of about 60 scientists and was nominated Academy Professor by Academy of Finland (2001-2006). His research group was elected as a Centre of Excellence in Research by the Academy of Finland for the years 2000-2005. He is also director of Tampere International Center for Signal Processing (founded 1997) that has already hosted numerous visiting scientists in Signal Processing as well as organized workshops and conferences. He has about 25 years of experience in teaching both undergraduate and graduate level. He has likewise 25 years of experience in scientific research in mathematics, communications theory, and signal processing. He has authored over 400 papers and four textbooks on signal processing and its applications. 1. Quality of Biological Samples. 1.1 Tissue Acquisition, Handling, and Storage. 1.3 Tissue heterogeneity and Laser Capture Microdissection. 2. Microarray Production: Quality of DNA and Printing. 2.1 Quality Control for cDNA Probes. 3. Quality of Microarray Hybridization. 3.1 RNA and cDNA Labeling Quality. 3.5 Automation of Microarray Hybridization. 3.7 Validation of Microarray Experiments. 4. Scanners and Data Acquisition. 4.1 Basic Principles of Scanners. 4.2 Basic Principles of Imagers. 4.3 Calibration and PMT Gain. 4.4 Characteristics of Different Noise Sources. 6. Quality Control in Data Analysis.